You are here: Home / Administration / How can I bulk import Users to my Office Chat network? 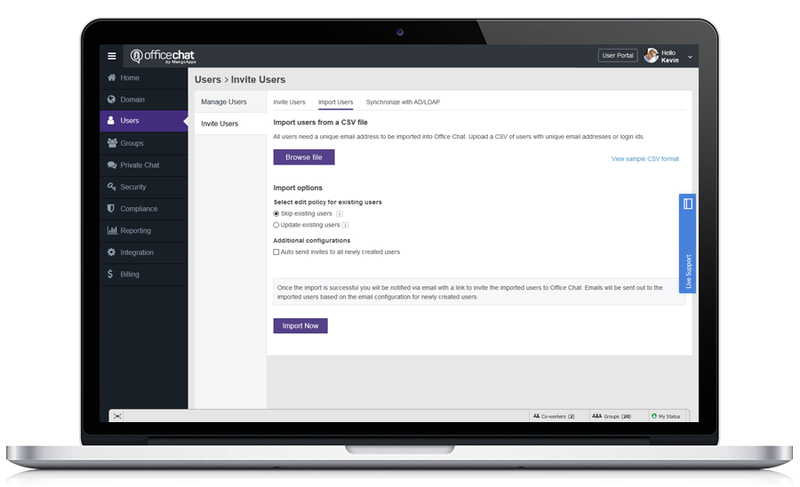 This article will show you how to invite people in bulk to your Office Chat network. If the network admin wants to invite a large number of users to the Office chat portal, then you can do it by using the “Import CSV” feature in Office Chat. To invite users by importing them from a CSV file. First, you need to create a CSV file with the first line being the field headings and all subsequent lines being field values for each user to be invited. It’s recommended that each field is surrounded by quotes. This means that each value must not contain any quotes of their own so please pay close attention to the CSV file must be made accurately and include no quotes for field’s value. TRUE- This will activate an existing user if the current status is Deactivated. If the user is not present in the domain, then the user will be created. FALSE – This will deactivate an existing user if the current status is Activate. If the user is not present in the domain, then the user will not be created. – If the Enabled field is left blank, then the user state will not be touched. The format of the CSV file is below. The first line is the field headers, and subsequent lines are users that will be imported. Go to the Admin portal of your Office Chat domain. No emails will be sent out to the imported users. Once the import is successful network admin will be notified via email with a link to invite the imported users to Office Chat.